She did not believe in a god as such, but equally she had never wanted to believe that the here and now, this life on this earth, is all there is. She did not think that praying to a greater power was the way to heal, find happiness or seek whatever we are looking for, but she did believe that we all have the power within ourselves to find our path. Nevertheless, she had always been fascinated by those whose lives are rich because of their faith, who find answers where she had never looked, who believed that a greater power would hold their hand and guide their way. She did not understand, did not judge, but in many ways envied their total belief that that they would find their way, because they believed. It is love and it is hope … however and wherever we find it. Buddhism had touched her life when she had dipped in and out of yoga and meditation practices over the years, and she was curious to see a country where faith was not a lifestyle choice but a life’s journey. On her travels, she had always found extraordinary, whatever the faith, the desire to demonstrate ones commitment to ones faith by donation, often, it seemed to her, by the most poor to the most rich …. even more extraordinary, here in Myanmar, one of the poorest countries in the world, to see gleaming gold pagodas peeping out of the vegetation at every turn, as their plane came in to land. It would be churlish and disrespectful to say that it’s all in the size of your pagoda … or indeed your buddha! But there are a lot of them, and some of them are huge! A large shed, north of Kandawgyi Lake in Yangon, houses the impressive Reclining Buddha – 66 meters long! White face staring benevolently down, a vision of gold robe, red lips and finger nails, and feet so large that a platform has been erected at its feet to read the 108 characters painted on the soles. But this had nothing on the Shewedagon Pagoda. For a buddhist, especially a buddhist in Myanmar, this 98m high gilded stupa which dominates Yangon’s skyline, is regarded as the most sacred buddhist pagoda in all of Myanmar. Monks, swathed in their distinctive saffron robes, going about their day, gliding silently amongst those who had come to pay their respects and those, like her, who had come to see this most sacred of shrines as the sun came down. Barefoot, she walked around the stupa, gold, resplendent, towering above her. It was one of those moments when being a tourist feels invasive, out of place. So important to respect the privilege it was to be there. Everywhere, the offering of prayers and flowers, and the lighting of candles around the vast perimeter of the padoga. Flames flickered in the sultry evening breeze, the sun slowly fell in the evening sky, its glow falling onto the gold stupa …. a hush descended on the gathering crowds, a moment to be still, to think, to pray .. . It was spell-binding. It was faith …. and it was beautiful. How to begin to describe the trip of a lifetime? Everything about it would be a challenge …. the place, the people, the food, the language, the climate … but that was the point. Life for her was, these days, all about finding out about herself by being brave enough to do extraordinary things that she never dreamed she would be able to do, and pushing the outer limits of her comfort zone. Travelling in Europe, often little more than a 2 hour flight from home, had once felt so adventurous, but now she knew that she would probably find enough that was reassuringly familiar … a comfortable safety net wrapped around her travel plans. So how far to push that comfort zone, how far to step out of Europe? Well, South East Asia would do it! Not one to follow the crowd, Thailand, beautiful though it looked, did not appeal. It’s poorer neighbour, Myanmar, did. A nation whose people would still be curious about seeing Westerners wandering its streets – how amazing in this day and age, where everything seems so accessible, to have the privilege to visit a country still tentatively learning the huge impact that tourism would have on the very essence of its being. As is often the way when we plan a trip abroad, it seems that suddenly that very place is appearing everywhere in the news. Is it that many of us are so absorbed in the mundanities of our everyday lives, that we are aware but somehow not aware of events in the world around us until they threaten to impact on our own. How ridiculous that she had read everything from “The Glass Palace”, chonicling Myanmar’s chequered history since the reign and enforced exile of King Thibaw, to the diaries of Aung San Suu Kyi, yet, until she turned on the news a few weeks before their departure and watched in horror the footage from the Rakhine state, she had not registered the ethnic cleansing that had been happening there for years. Not something you find in the tourist brochures, that’s for sure. So the decision had to be made – to go or not to go. Advice was sought, both official from government sources, and unofficial from friends of friends who had travelled there before, or who lived in South East Asia themselves. Safety was always a concern, though in troubled times, security can be far better and in a way, one feels safer for it. What played on her mind was the political situation and if she still felt comfortable visiting a country in such turmoil. It was not an easy decision, but in the end, it came down to the hope that, by going anyway, her visit might in some small way make a meaningful impact on the lives of the some of the people she would meet along the way. And so, as temperatures in the UK started winter’s downward spiral , she and a friend headed to the airport with suitcases packed with sun hats, mosquito repellent and summer shorts. She’d never been on a flight so long that she somehow mislaid Sunday afternoon, on a plane so large that she had to go upstairs to find her seat …. The adventure was about to begin …. It was certainly a bit of a Thelma and Louise moment. It was probably the pink helmets that did it. Three days in to their spring break in Mykonos, it became clear that the only way to reach the tiny unspoilt bay on the other side of the island, was to hire some wheels. Whilst a car was the sensible option for two ladies of a certain age, quad bikes looked infinitely more exciting. And so it was that they edged their way out into the morning traffic, with nothing but a rudimentary map and a vague sense of direction to guide their way. 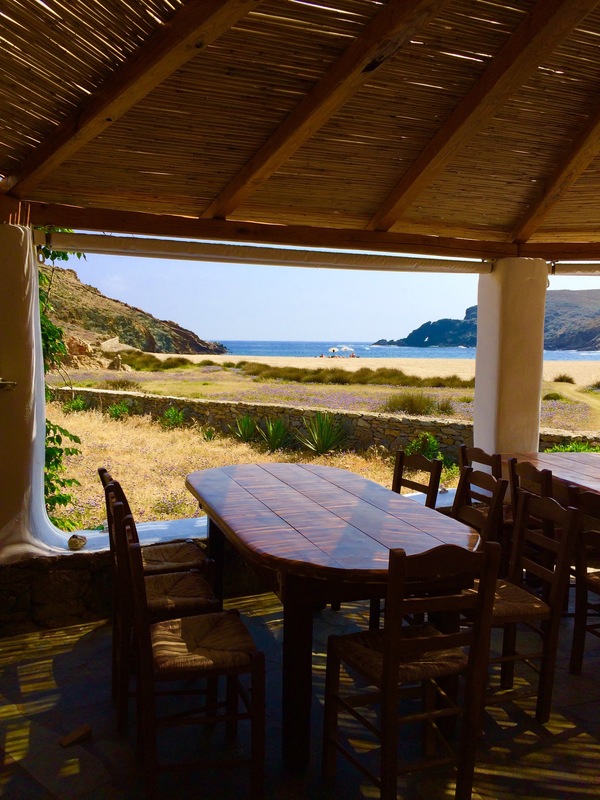 They had happened upon Mykonos purely because the right travel deal came up at the right time. Its reputation as a party island preceded it. Party girls they were not … but pictures of the unassuming family-run hotel just outside Mykonos town, low-rise, white-washed and draped in vibrant bougainvillea, lured them to this tiny dot of a Greek island. Mykonos turned out to be a surprise in every way. The town itself was a short boat taxi ride across the bay … what a way to arrive! Chugging into the mooring, they got their first glimpse of the iconic paving that winds its way through the narrow streets of the Old Town, inviting them in to explore it’s maze of quirky local bars and high end fashion retailers … this tiny island certainly attracts the money. Shopping is more about Armani than trashy souvenirs. Standing proud on the ridge, the time-worn windmills watch the to-ings and fro-ings of this busy harbour, like they have done for centuries past. The famous party beaches weren’t for them, but the rest of the island remained surprisingly untouched by mass tourism, and the notion of the romantic Greek island idle that Shirley Valentine gave us in the 80s, can still be found in its barren hills, dotted with white-washed rural hamlets and tiny chapels peeping out at every turn. 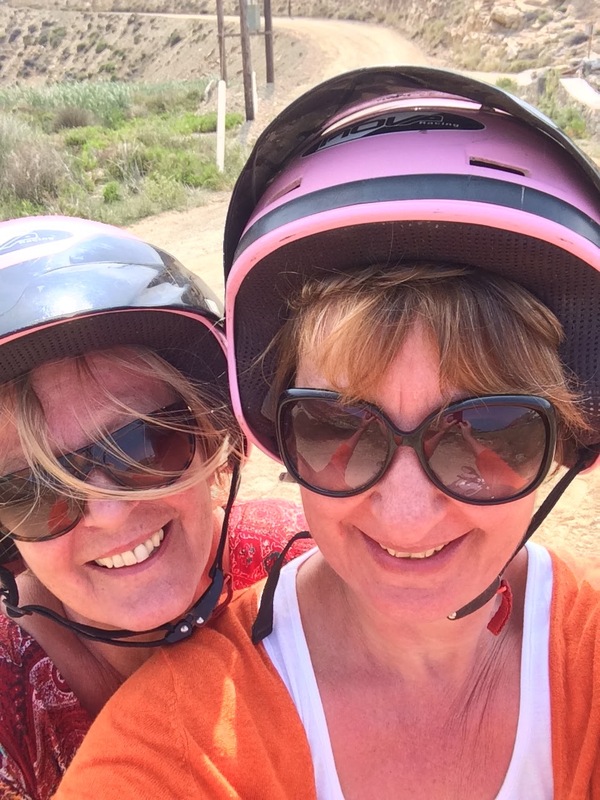 Giggling with delight at the absurdity of how they must have looked to the locals, two English woman on a quad bike, pink helmets, old enough to know better, they jolted their way along the dusty tracks across the island to Fokos, recommended by a friend for its not-to-be-missed taverna. Just as they arrived, the locals started to spill in, bearing gifts for the staff on this the first day of opening for the summer season. They felt they were intruding on a secret party, but were welcomed like long lost friends and beckoned onto the veranda to enjoy their meal lazily sitting in the dappled shade overlooking what can only be described as an island paradise. For the people, for the food, for the place …. it was one of those “do you remember” meals. Total bliss. Mykonos … one of those places that where time passes so slowly, but a holiday is over so soon. A definite must-go-back-one-day …. Of course, it wasn’t challenge enough to solo travel for the first time. In a moment of madness, she decided to put something a little crazy in the mix, just to make sure this, for her, was the mother of all challenges! So she booked a sight seeing tour around the Tuscan hills … on a Vespa! Sound enough idea for an experienced motorcycle driver who had driven on the wrong side of the road before. She’d done neither the motorcycle or the side … ever!! Crazy or what? That’s the funny thing about fear. Once she’d looked it in the eye, it had nowhere else to go. She’d realised that only way to find out how to travel alone, was to do it! It was a huge, life-changing life-enhancing decision … the icing on top of the cake that was her new independent grab-every-moment life. Hiring a Vespa? Just the cherry on the icing! It wasn’t without trepidation however that she presented herself at the allocated time at the hire centre. Ten minutes later, after a quick run through of the essentials (basically how to start and how to stop), she emerged into the madness that is Florence’s mid morning traffic. In the group of a dozen or so riders, some pillion, she was the only solo woman of a certain age. A object of some curiosity to the youngsters and the couples! She rather liked that … though they did collectively take it upon themselves to keep her in the middle of the pack out of harm’s way. Bless. They wound their way up and up until Florence disappeared into a valley behind them. Clear of city drivers, with the dusty tracks to themselves, she began to relax, loosen her white knuckle grip on the handlebars and enjoy the Tuscan hills that stretched before them, just like they are in the movies. Cypress trees standing tall and straight on undulating hills, row upon row of vineyards ready to harvest, sprinkled with sun-mellowed terracotta villas. The locals, intent on their daily tasks, watched bemused as a crazy English woman whizzed through their tiny hamlets, squealing with the freedom of it all. She couldn’t believe she was actually doing it. She felt like she could fly. And life felt so, so extraordinarily good. The unpretentious family run hotel situated right at the end of Ponte Vecchio was perfect for a female first time solo traveller. Everything she wanted to see within touching distance, and a friendly face to come back to after a day’s “determined not to miss a thing” sightseeing. A three night city break, particularly going solo, is more than enough time to get to grips with most cities. With no-one else to please, she could focus on the things she wanted to see and do …. with the freedom to take, literally, a different path whenever she felt like it. The Florence must do’s – the Uffizi, the Pitti Palace, the Duomo of course – called to her like presents that are so beautifully wrapped, it goes without saying that what’s inside will be something special. Botticelli, Michelangelo, Leonardo, Caravaggio … the names just roll of the tongue, all there, conjuring up a veritable cultural feast for the soul. The highlight for her, seeing the towering presence of the David standing tall at the end of the main gallery at the Accademia, took her breath away. He’s quite something. What she hadn’t anticipated was that the whole city feels like an architectural extravaganza, the most stunningly buildings at every turn. But it doesn’t seem to show off about it. Florence waits to be found, like a serene and beautiful woman, who is quietly confident in her own skin. She had her hand on her bag ready to go through passport control on her own. With no idea what had delayed her friend, it was a choice of waiting and missing the flight, or going it alone and working things out. Her friend made it, just …. but that decision to go anyway answered a question that had been playing on her mind for a while. Would she be brave enough to travel alone? The answer, to her genuine surprise, was unquestionably yes! To a 50-something solo female first-timer, Florence seemed challenge enough for now. A couple of hours flight (so not so far away that she couldn’t be “found” if she got into trouble, she reasoned), good weather (nothing worse than sitting alone in a hotel room if it was pouring), lovely people (she’d never met an un-friendly Italian), familiar cuisine (like a comfort blanket while she addressed the “eating on my own while trying not to look like I’ve been stood up” scenario)… and long on her bucket list. Flying alone for the first time, the first thing she noticed, was that …. she was on her own! Tourists tend to travel in groups. Excited huddles of giggly female travellers sharing “must-do’s” and “have I packed’s”, couples in their own couple-y world, families trying to keep errant toddlers under control …. and her. It might just have been that flight, that day, but it felt as though everyone was staring at her”alone-ness”, as if she had a big arrow pointing down at her in the bustling departure lounge saying “she has no friends”. She topped up her lipstick and tapped out a message on her phone …. signs to all concerned that she was being met at the other end by her Italian lover. That would explain it, naturally. Of course, in reality, no one was concerned at all about the pale slightly fidgety middle-aged woman sitting near the departure gate, passport clutched tightly in hand, ready for the off. Or that she’d checked three times during the wait that her currency and travel documents were still where they were … last time she’d checked. Or that her hand never left the handle of her cabin luggage (can’t be too careful). Or that the message she was tapping out to her Italian lover … was actually a post on social media because she had to share her excitement with someone! Or that the seat next to her was … empty. No one cared. Absolutely no one cared. And it was while she sat there getting used to the idea that, to anyone else, she was just another passenger waiting for her flight … that she finally got it! Solo travel means that the only person you have to worry about is … yourself! You can do what you like, when you like, if you like, how you like – and no one gives a damn. How liberating is that! They actually didn’t care of course … but neither did she.